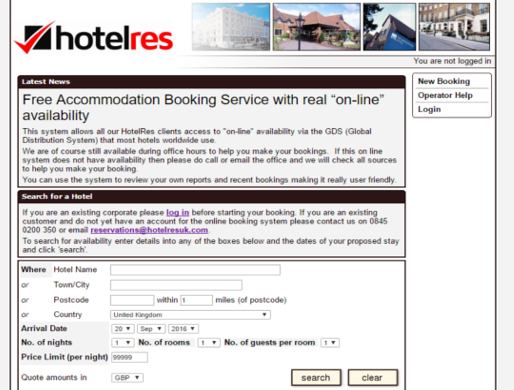 HotelRes provides a complete worldwide accommodation booking service. Specialist consultants use their experience and knowledge to book you the hotel or apartment that most closely matches your requirements. All distribution channels are checked to ensure that reservations are made at the best possible rate at the time of booking. For employees that are relocating and who may want a long stay of 6 months or more try the Corporate Housing service. Working with our partners at Phoenix Relocation a turnkey solution for corporate housing all over the UK is offered. The team find available rental properties and work through all the processes needed until the property is ready for your employee to move in. There is one monthly bill to include all utilities, rent, council tax, WiFi and any furniture rental that you require. For more information please download the PDF to the right. In addition, a free custom branded online booking tool for worldwide accommodation is available. This can be particularly useful if reservations are required outside of normal office hours. Specially negotiated, company specific, corporate rates can also be made available via your branded on line system. It is a great pleasure to work with HotelRes, the service they provide is fantastic, and the speed in which it takes you to ask for a hotel and receive confirmation is outstanding, everyone is very helpful and even when it comes to somewhere tricky they always seem to find a decent hotel, recently I had to book a hotel and a conference in a very odd part of the world and still HotelRes came out on top and found a great hotel that also accommodated for every need. We have been using HotelRes for several years and they never fail to provide a brilliant service. They save us a huge amount of time and effort, from finding a single hotel room to a large conference venue. Having one point of contact for hotels around the world makes life very easy for us. Everyone on the HotelRes team is very professional and also very friendly so it is always a pleasure to deal with them. The event was a tremendous success and your input regarding the accommodation arrangements made this aspect all run incredibly smoothly & you have been exceptionally helpful, friendly and efficient throughout. By providing a professional and expert worldwide corporate conference and reservations service, we are committed to both customer satisfaction and the continual development of the company.